Its super easy you don't need any special tool to create this design but the key to this design is patience. For creating this design you need to choose 3 colors of your choice. its preferred u choose more of opaque colors because you would be doing little bit of layering on your nails. Because its summery colours and also, i was inspired by color selection of Essence Miami roller girls theme. Ok, Go and grab your 3 colors and let's get started. Create another diagonal line using your 3rd color, going in opposite direction of your first line. creating an X. Continue making your diagonal lines using your 3 colors. Its ok if your lines are not perfect. Seal it with your top coat to remove any imperfection and to protect your design. And That's it !!! remember that you can use any colors u want. 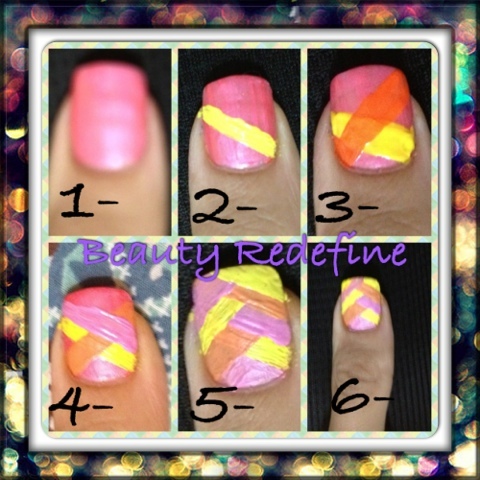 I will categorized this tutorial as EASY and it will suit more on long nails. what do you say ? are you ready for some medium and difficult level tutorials ? PS : Ignore the untidiness of my nails I just cant wait to finish off with my art.